Recently I wrote about HiFi for Beginners and in the article I mentioned that a CD based system could be had for under the 1000€ mark with a mp3/Smartphone based system for even less. Now obviously you all believed me as everything written in TNT is the Truth, the Whole Truth and nothing but the Truth! 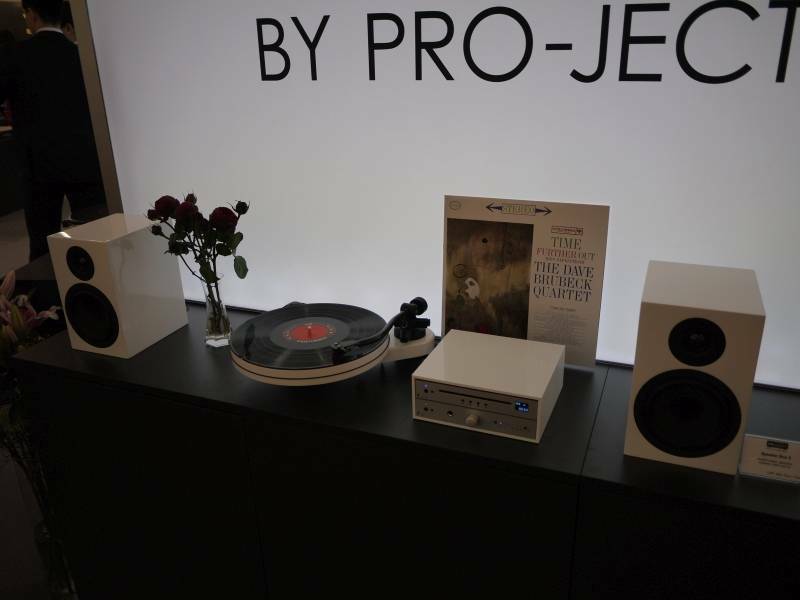 However I felt a moral obligation to prove this to you so here we go with a lovely budget system from Box Designs - the micro component product line from Pro-Ject. The system in question consists of 2 boxes. These are the MaiA CD and the MaiA integrated amp. Coupled to these we have a pair of Speaker Box 5 bookshelf speakers. Pro-ject also supplied a matching cable set and this is thankfully included free of charge with the purchase of such a system. This may not seem much to those of you who spend 100s of your chosen currency on cables but for the budget conscious buyer this is much appreciated and means there are no hidden costs. So hats off to Pro-Ject for that one. Project also supplied me with the matching speaker stands and component case although these do up the budget a little bit above our target. Whether you need them will depend on your environment and the space you have available in your room. The MaiA CD is probably the smallest component CD player I've ever come across. It's difficult to appreciate how tiny this thing is until you ralise the almost full width slot is CD width! Nevertheless into a box not much bigger than CD case it packs a easily legible dot matrix display, simple controls (Play, Stop, Next and Previous) and both digital optical and analogue outputs. Naturally due to the size of the case the power supply is an external unit which I guess could be replaced by those of you who are not averse to a bit of tweaking with a higher spec unit for even more bang for the buck. Internally it packs a 24bit/96kHz 8 times oversampling DAC although the optical output does make it a possible candidate for use with a higher spec DAC in the future. The MaiA CD costs 349€ in black or silver and comes complete with a small but fully functional remote control. Here Pro-Ject have really pulled out the stops in the minaturisation game. The case size is identical to the MaiA CD allowing them to be used together as I did in one of the Box Designs cases (see system photo above) giving a proper hifi system that's about the same size as a hardback edition of Lord of the Rings (for those of you that actually bothered to read it and didn't just watch the films). In this space Pro-Ject have managed to pack 9 (count them !) inputs, 1 output and a pair of speaker sockets on the back. The inputs include include MM Phono (hence the Turntable the eagle eyed amoung you will have spotted in the picture above), 3 line (2 on RCA sockets and one on 3.5mm jack), 4 digital (2 Toslink, 1 Coax, and 1 USB) and a Bluetooth antenna. To do this the MaiA is obviously a digital amp incorporating Flying Mole modules to give 2x25W at 8 ohms with this figure rising to 37W at 4 ohms. If you need more power or a second zone there is even a pre amp out. The've also managed to cram a 24bit/192kHz DAC somewhere inside and a 1/4 inch headphone jack socket on the front. All this comes in at 499€ again including remote control and is available in black or silver. The Speaker box 5 is the larger of the two bookshelf designs in the Pro-Ject range. It's a 2 way design with a 130mm fibreglass mid/bass unit and a 25mm silk dome tweeter. Sensitivity is quoted at 86dB/W with frequency response going down to a creditable (for a speaker of this size) 55Hz. Its 160mm wide x 255mm high with a depth of 210mm ie smaller than a sheet of A4 (that's letter size for our US readers) paper. It's supplied with simple wall brackets with optional desk stands or floor stands (as shown above) . The Speaker box is also magnetically shielded so there are no issues having it close to a monitor or TV. Available finishes are Piano Black, White or Red so you should be able to find something to go with your room. The Speaker Box 5 retails at 249€ for the pair. Those of you who have been keeping score will have noticed we're over the 1000€ budget. You're not wrong but if you want CD only there is a simpler Amp Box at 249€ and if you only want to stream music via Bluetooth we can ditch the CD player both of which get us back on budget. However as we will see the versatility of the MaiA makes it worth saving that bit extra for. The system took me abou an hour to assemble as there is quite a lot of unpacking required but it all went together easily and the only worry I had was not damaging the superb piano black finishing. I was particularly pleased that the speaker stands were supplied with floor protectors for the spikes - one less thing to damage the floor tiles. I placed the system in its supplied case and the case on one of the shelves of my Lavardin K Rak. Following the instructions in the manual I set the speakers 50cm from the rear wall with a reasonable amount of toe in. I started off by giving the speakers a whirl on their own using my usual Canary Audio 608LV amp and either the Naim CD5i or my Linn Axis/Akito.Reson Etile/CEC PH53 combo. Immediately I was struck by the additional detail and staging when compared to my habitual Linn Index IIs but I missed the coherence of the Linns along with the bass response. A bit of head scratching later I remembered that ideally a bit of run in time would probably not go amiss and hopefully bring back the coherence I was missing. So I hooked the speakers to the rest of the system and let them run. I'm not going to say there was a revelation or a veil was lifted or any other clichés but the running in definitely improved things. That and a move of the speakers back towards the wall (around 30cm out in my fairly large room)improved the bass weight without compromising the imaging or speed. Let's get the criticism out of the way first - this player doesn't beat my Naim player. The Naim is faster, deeper, more atmospheric and costs more than the whole system in question. But what the MaiA CD does do is play music in a thoroughly enjoyable way and doesn't have any obvious shortcomings which is what a budget component should be all about. Detail is good, treble is precise and bass on time. If you go looking for hifi faults you can find them but they're not musical faults. If you put disc on this player you're not going to be picking faults in the performance - yes the imaging isn't as wide as a better player and as an example if you listen to Daughter's "Winter" from the "If you leave" album you'll get a very good perfomance. What you'll miss is a certain level of atmosphere and realism in the soundstaging and instruments. The important bit here is that you're going to enjoy what you're hearing and you're going to forget this is a 349€ player. And that is the thing which IS easy to forget. We're talking entry level price but not entry level sound. The MaiA is the real star here and not only from a minaturisation point of view. Over the review period I ran it with it's partnering CD Player but also with the Naim CD5i or my Linn Axis/Akito.Reson Etile/CEC PH53 combo. In both cases it let the music flow without any obvious obstruction or added artefacts allowing the improved resolution of both sources to be clearly heard. I tried Prince's Lotus Flower out on vinyl and came away extremly impressed. Imaging was really good with instruments clearly delineated in space and obvious forward and rear placement. There was also some pleasant texture to the instruments particularly the analogue nature of the electric piano and the way it breaks up. We aren't of course talking about what people consider valve like (mythical? )warmth here and "phat" bass is definitely not on the cards but again the amp does the important bit and gets the musical message through. With the Naim Cd5i and Nelly Furtado's "Say it Right" the MaiA didn't suffer on the very dynamic drum track keeping control of proceedings and producing a lively, snappy sound through the Speaker Box 5s. This is no mean feat for such a small box and driver combination. As the MaiA amp is equipped with a Bluetooth Antenna I paired it up with my old faithful Iphone 4. This is really easy assuming you RTFM - otherwise it'll take 2 goes but in any case I was up and running within 2 minutes. Here I was really surprised as generally streaming isn't my cup of tea. I fired up the McIntosh Music stream and happily spent the afternoon with some 60s thru 00s classics without feeling the need to faf around with big or small discs. Youtube was unsuprisingly less successful and the compression and what appear to be phasing effects on the treble inherent in the format are thoroughly evident although that didn't prevent me playing Faithless' "Insomia" loudly on several evenings after work (mental note to self - buy the album!) This again was a good show of the amp letting the music through as despite the quality criticisms inherent to Youtube the song itself remained inherently danceable and I'm sure would impress most non dyed in the wool audiophiles which is to a large extent the target audience. Now before you go writing in and pointing out that Youtube is not to be considered a music source and that I'm wasting your time I would suggest observing where people head to if you ask them to put on a song they don't have. The onboard DAC wasn't initially on speaking terms with my Panasonic BluRay player when I hooked it up via fibre optic. A quick adjustment to the BluRay sound format (PCM is required) and opening sequence of Star Wars IV was sounding very good with the orchestra clearly spread in front and the Star Destroyer rumbling in from the right. I remember reading once that a good quality film soundtrack can have more effect on the viewing experience than improving picture quality and this was certainly the case here even for a film I know the script to. The DAC was also a vast improvement over the Panasonic's output stage on U2s Vertigo Tour film making it much easier to hear what's going on with the Edge's double refrigerator size guitar rack and better focussing the bass and drums making the whole show easier to follow. You can just sit back and focus on the screen without straining to hear things that get lost via the Panasonic on it's own. Now if only Pro-Ject could add a filter that cuts out Bono every time he says something stupid or unnecessary they would be onto even more of a winner. Negative points? There is quite a bit of hiss from the amp at high volumes although this is only intrusive if you stand near the speakers when the music isn't playing. Also the inherent small size of the controls means the ham fisted among us would be better using the supplied remote rather than the volume knob. Again the small nature makes connections round the back a bit difficult but this is more a problem for those of us who chop and change components rather than for someone who is going to live with the system. I'd also suggest that the absent minded among you write down what is plugged into what input as I got confused remembereing which CD player was in which input and which digital input was the optical one. Again the physical size of the amp prevents clearer labelling and to be honest I'm nit picking. Imaging is a very strong point on these speakers with very tangible soundstages and what they may lack in scale they make up for in precision. Presentation is intimate rather than grandiose but as I alluded to above when presented with some dance music they are far from letting the side down and get down and boogie. From distant memory I would say they have plenty in common with good old Rega Kytes which is no bad thing in my book. Balance wise they are good as the treble is not exaggerated compared to the bass even in a modern furnished room - I ended up running them fairly close (30cm) to the wall without any obvious booming which no doubt helped this but even at 50cm out from the wall they weren't unbalanced or harsh. I would suggest that this is not the ideal speaker for a large room as they don't really drive the room. I would also say that if you are a bass freak they are not for you. Pro-Ject has a larger floorstanding Speaker Box 10 in the range and while I've not tested it I would suggest this may be an alternative for those with larger listening areas. If however you are looking for a speaker that is visually compact, has a high WAF, fits a modern interior and above all is just plain old communicative then form an orderly queue at your nearest ProJect dealer's door. What is really important here are the possibilities that ownership of this system opens up. Assuming you restrict yourself to our 1k€ budget and only buy the amp and speakers you can connect up your smartphone, your tablet, your PC, your DVD/BluRay player and your PS4/Xbox. The increase in enjoyment potential when compared to a music centre or soundbar that this system can provide is phenomenal. Not to mention that you can then buy a turntable as shown in the picture above and head down the path to the Dark Side. I ran this system for over four months during which time I didn't feel the urge to switch on my beloved valve amp or plug in any larger speakers. I admit to running a better CD player at some (but no means all) the time and it was easy to live without the better player when the other line input was required. This alone means it must be ticking a lot of the right boxes. To sum up - it's compact, sounds excellent, looks good, is easy to use and is well priced to boot. If you're looking for your own HiFi for beginners or something to recommend to a friend who is about to dip their toe into the bathwater that is the world of hifi, a trip to your local Pro-Ject dealer may well be a very good place to start.